The very first time I saw Avengers 2 Age of Ultrons movie trailer, I knew I have to make the Hulkbuster, the new Iron man suit armor into paper model. I posted about that plan on Paper Replika Facebook page on 2014. So here it is on January 2015, the first part of 4 segments is released. The Hulkbuster scale is the same as previous Iron man models, which is 1:6, so the Hulkbuster will be 60 cm in height when it complete. 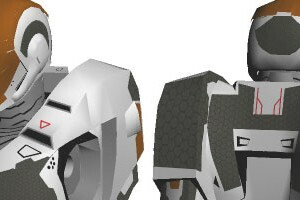 The 4 segments are : head model, torso, arms and leg. This Hulkbuster armor suit is a lot different the comic book version and a lot cooler off course. There will be blank template but it can only be made if part 2 is already released, because the first part only have 2 pages, too few. I still have not decided whether it will be made articulated (action figure) or statue. This Tony Start papercraft / paper figure template was submitted by Saurabh Jethani. He wanted his work to be hosted in paper-replika.com. 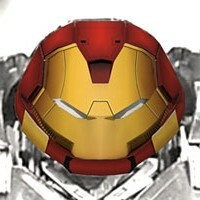 The reason was, he thought Tony's papercraft should be in the same site as other Iron Man papercrafts. So Iron Man fan can download it and build it for free. He shared the template in 2 PDO files, one with lines and the other is without lines. You can open this template using Pepakura Viewer, as you may know PDO file can be a pattern and an assembly instructions at once, so there are no graphic image instructions as usual. This is part is only a beginning, the leg will be added soon after he finished preparing the rest of the part. 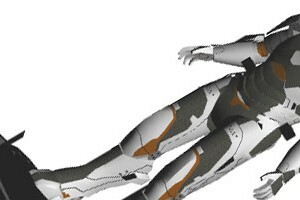 The last part for Iron Man Mark 39 Gemini. The templates consists of 16 pages of patterns included 10 pages of leg parts, and the rest are for a display stage. Cristiano and Suraj also made a pdo file beside graphical assembly instructions, however there is no assembly instructions for the display stage, you have to figure out yourself. This project was started on September 2013 and finished on end of January 2014. 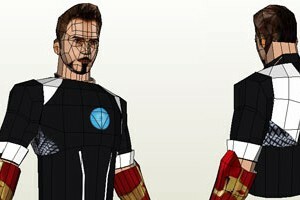 Part 2 consists of patterns to make the hands of Iron Man Gemini. The pattern only consists of 4 pieces. The patterns are identical for left and right hand, just in the opposite direction. In this post I also wanted to show a photo of paper models of iron man that were build by the Uzan from Ponjong.. In the lower left corner are the result of an assembled Iron Man Gemini . Uzan has changed the color pattern to plain pattern to create that model. Uzan using fancy papers, Stardream brand. 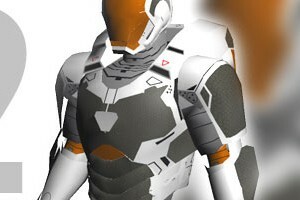 Mark 39 Gemini ini one of the coolest armors created by Tony Stark that is appears on Iron Man 3. It is created after The Avengers time line, in the climax end in the Avengers movie, Stark goes to space to bring the nuclear missile war head to destroy enemy's portal and his armor shuts off because the Mark 7 is not designed to travel in space. I think the use Gemini name inspired from the real NASA human spaceflight program that is also named Gemini, Project Gemini on 1965 to 1966. The scale of this paper model is 1:6. This part 1 template consist of 5 pages of patterns and was designed by duo Cristiano and Suraj.